An Adventure in UK Space and Linear Time: Part II! When Steven, Erika and I discovered we had enough money from our Patreon supporters to head over to the UK, one of the first things on our agenda was to film a video to tie into the opening of our (then) upcoming live show at Gallifrey One. Steven spent a productive day at work cooking up the story, the inestimable Simon Harries volunteered to shoot and direct, and I steeled myself for some serious editing time once I’d returned to Canada. But first, the shooting! What have I been up to for the past few months? Quite a bit, actually. In November I went to the UK for the first time, which has been a lifelong ambition. I’ve always wanted to visit New York, Tokyo and London…and now all three can be checked off the list. In fact, I managed to pack New York into my UK trip on the way back…but more of that later. 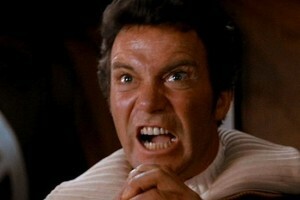 Star Trek is sick, and the cure for what ails it isn’t another bombastic brofest. Allow me to explain. Though I’m best known as a Doctor Who nerd, my first introduction to science fiction in a visual medium was Star Trek. As a six-year old in the mid-70s I was intrigued by the colorful costumes and derring-do of the original series, and I never really lost that interest until the series started hitting the dirt around the mid-point of Voyager. Here’s the final episode of Video Free Skaro for your enjoyment. It’s much longer than the usual episodes and it’s chock-a-block full of interviews, action figure shenanigans and other goodness! And if you’d like a breakdown of how and why we made it and why we’re finishing up with it, read on. That fine piece of work above is Gallifrey Academy, my latest short Doctor Who film. Every year I try to make a short film in advance of Gallifrey One, the biggest Doctor Who convention in North America (more on that later.) This year I was lucky enough to run it ahead of our Radio Free Skaro live show in front of a big crowd, and it got a pretty decent reception. Kyle Anderson, a friend and writer for The Nerdist, also featured the short in his Gallifrey One wrap up. The film featured the talents of Eric Fell, Joanna Gaskell and Shaun Stewart in front of the camera, as well as a certain Time Lord whose identity I’m not at liberty to disclose. All those named can be seen here in Vancouver at the Critical Hit Show, a hilarious live Dungeons and Dragons improv that happens every month at the Rio Theatre. Laurel Brown, Vanessa Driveness (who also played an apathetic Shobogan) and Mel Siermaczeski also helped out behind the scenes. And how was Gallifrey One (or Gally, as its know to its many fans)? Simply amazing. I’ve been for five years running now, and the sheer amount of Whocentric content never ceases to amaze me. Shaun Lyon and the other hard-working people who have been putting on the convention for a quarter-century(!) pour their heart and souls into this yearly event, and it shows. Now matter what you’re into in the Whoniverse, there’s someone else at the convention who digs what you dig. What’s next? Well, it’s a guarantee I’ll be at Gallifrey One next year, and I’ve got a few ideas for the next short film. I try to be more ambitious with each film, so next year, expect ILM quality visuals and a 6 hour running time. No pressure.